Abstract. We consider a two-parameter family of maps of the plane to itself. Each map has a fixed point in the first quadrant and is a diffeomorphism in a neighborhood of this point. 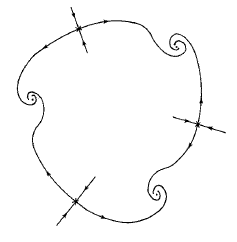 For certain parameter values there is a Hopf bifurcation to an invariant circle, which is smooth for parameter values in a neighborhood of the bifurcation point. However, computer simulations show that the corresponding invariant set fails to be even topologically a circle for parameter values far from the bifurcation point. This paper is an attempt to elucidate some of the mechanisms involved in this loss of smoothness and alteration of topological type.